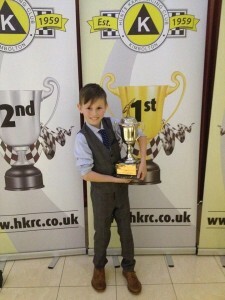 Team Wright karts member Ben Cochran, a 9-year old pupil from Kesgrave has been awarded the Mark Hines Memorial Trophy at the HKRC awards, a trophy once won by Formula 1 World Champion Lewis Hamilton. Ben himself is hoping to become a formula one star of the future. The awards ceremony saw more than 700 young drivers from every corner of the United Kingdom vying for recognition in varying classes. Cochran received the award based on his sportsmanship and performance on the track during the British Championship race season, from January 7 to December 14 2014. Over the course of 12 race meetings, Cochran finished 8th overall out of 34 drivers in the Iame Cadet class. “I was shell-shocked when Ben was announced as the winner, and still am” he said. “I couldn’t be more proud of him”. 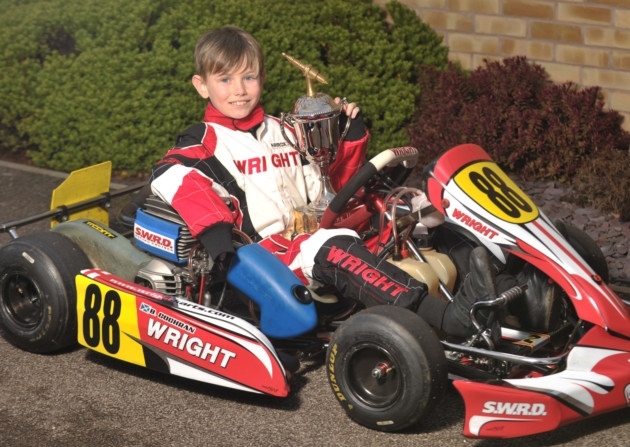 From Grantham in Lincolnshire, to Larkhall (Scotland), to Glan Y Gors (North Wales), and to Rowrah in Cumbria, Cochran has been competing at tracks up and down the country, piloting his Wright Apollo Chassis. The highlight of Cochran’s season coming as he was crowned IAME Cadet Club champion at Red Lodge kart club, near Mildenhall. Johnny, who used to race at a high level himself, continued: “In Simon (Wright), and Nick Chantler and Ross Martin, Ben has the best mentors and people around him. “He’s got the right team around him and he’s just going to keep on going at it.